Big, beautiful windows are one of the best parts of a room, and a feature you definitely want to show off. As your windows create such a focal point, it’s easy to forget about the importance of how you cover them. The window treatment you choose will bring your room together and add a meaningful finishing touch. There are a many number of products and textiles available to help you cover your windows, but what you select depends entirely on how you use your windows. Blinds are great for rooms in which you may want to partially block natural light or go into full private mode. They can be constructed from a range of materials: from plastic to wood, and also come in any range of colours. Blinds feature slats that can be tilted to let some, a little, or no light in, and they cast lovely mood-setting shadows when the light strikes just right. Shades are some of the most versatile window coverings available. They’re made by attaching a length of fabric to a sturdy mechanism, such as a frame or rod, and fitting directly over your windows. Shades are lowered and raised with a pulley system that doesn’t leave any loose strings. Unlike blinds that have slats, shades are continuous with no gaps in the material. Ideal for any size of window, they can offer partial light to full darkness, depending on the material used in construction. Although they have less “settings,” you can control the light you let into your space during the design phase by carefully choosing the opacity of the fabric of your new window coverings. Roller shades are true to their name: they roll up! These are a great window treatment option when you’re looking for something that will look inconspicuous when open. Like standard shades, rollers are constructed with a continuous piece of fabric (so take care in choosing the right opacity for your needs). The difference is that rollers spin into a neat roll at the top of your window frames when not in use. Best for minimalist designs, roller shades are especially popular in sitting rooms because of their sleek and unobtrusive look. Drapes are where things can take more of a turn for the creative. They can be made from almost any type of fabric and in any colour, pattern, or texture you desire. Drapes are hung on a rod above the window, making them easy to open (or play hide and seek behind). They give you the option to make a bold statement and are especially popular in main living rooms and master bedrooms. Again, opacity determines how much light will peek through your window coverings, so choose something heavier if you plan to sleep in, and lighter if you like to rise with the sun. Sheers are ideal for adding a little privacy without blocking a lot of light. They are frequently layered over shades or blinds to give you more window coverage options and kick up your style. Sheer curtains can make your space feel bright and airy, without the unfinished look that comes with completely naked windows. We love to use them in soft, dreamy bedroom designs for an added touch of whimsy and gentle movement. If you’re wondering what window covering ideas are right for your space, we’re here to help. Get in touch with one of our designers to book a consultation today! 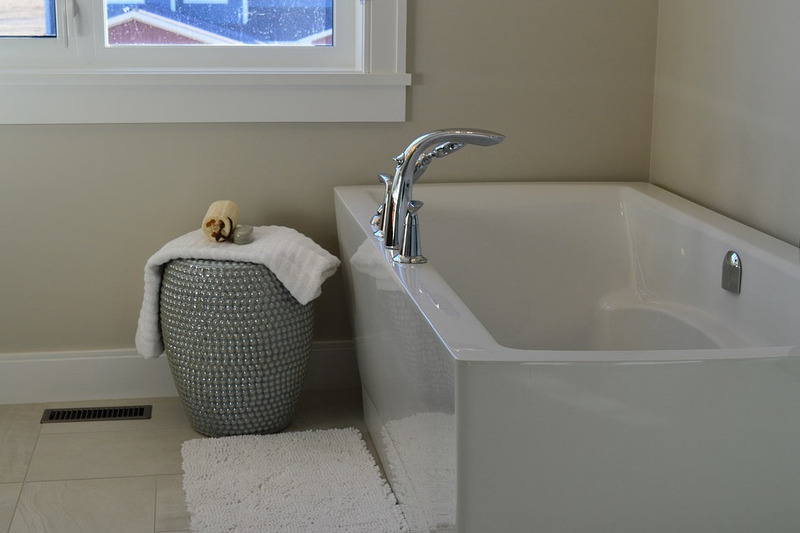 Planning a bathroom renovation and wondering how to budget? The cost of a renovation can be a big stress, but it doesn’t have to be. 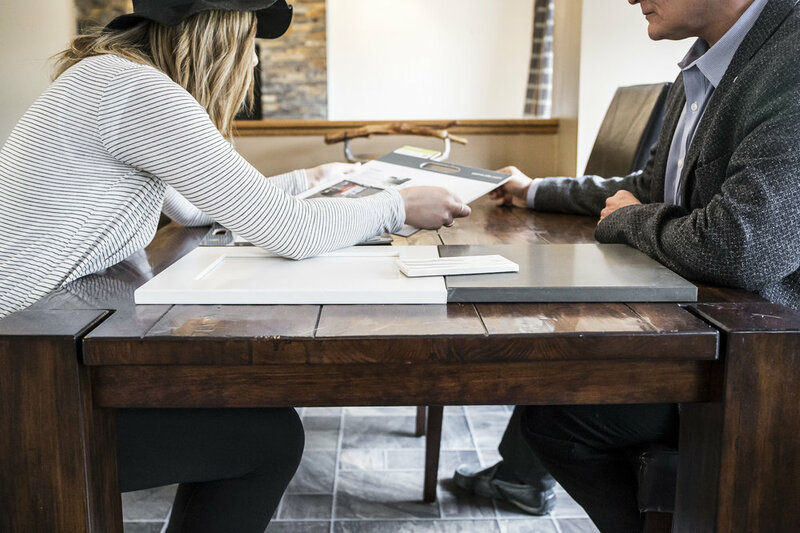 Getting an accurate estimate and setting a realistic budget at the start can take immense pressure off of your renovation (and save you unnecessary worry and headache). Here it is: the biggest expense of most bathroom renovation projects is - drumroll please… the cabinets! Cabinets account for about 34% of the overall cost of a bathroom renovation. Of course, if you can salvage your existing cabinets by refinishing or repainting them, it will make a huge difference in the overall cost of your project. Even adding a small touch of paint to your existing cabinets can really liven them up and eliminate the need for a full replacement. However, if you are going to replace your cabinets, paying attention to the type and quality will also make a world of difference to your budget. High-end cabinets (such as ones that are glazed instead of stained) can inflate costs, so try to avoid anything top-of-the-line or overly intricate if you’re on a strict budget. If you can’t swing the most luxurious cabinets out there, try splurging on cabinet hardware instead. Some glam handles and hinges can make average cabinets look extraordinary. Like any home remodel, a bathroom project requires saving. Take some time to get your bathroom renovation ideas together, figure how much you can save each month, how long you want to save for, and finally how much you’ll be able to spend. Having a number in mind makes planning your renovation much easier, and it helps you set a realistic timeline for when you’ll start your project too. Myth: designers make your bathroom renovation more expensive. Interior designers have made a career out of studying what works, what doesn’t, and what it takes to bring it all together. They respect your bathroom renovation budget and share years of wisdom and money saving tips. Designers can tell you where to splurge and where to save (on cabinets and more), and they have plenty of advice to make your ideas more cost effective. Find a designer that suits your style, and understands your ideas. You’ll be surprised how much easier it feels to have your own personal design sidekick to swoop in and help you find renovation savings. Although cabinets are usually the biggest expense, every feature you choose and every plan you make affects your bottom line. 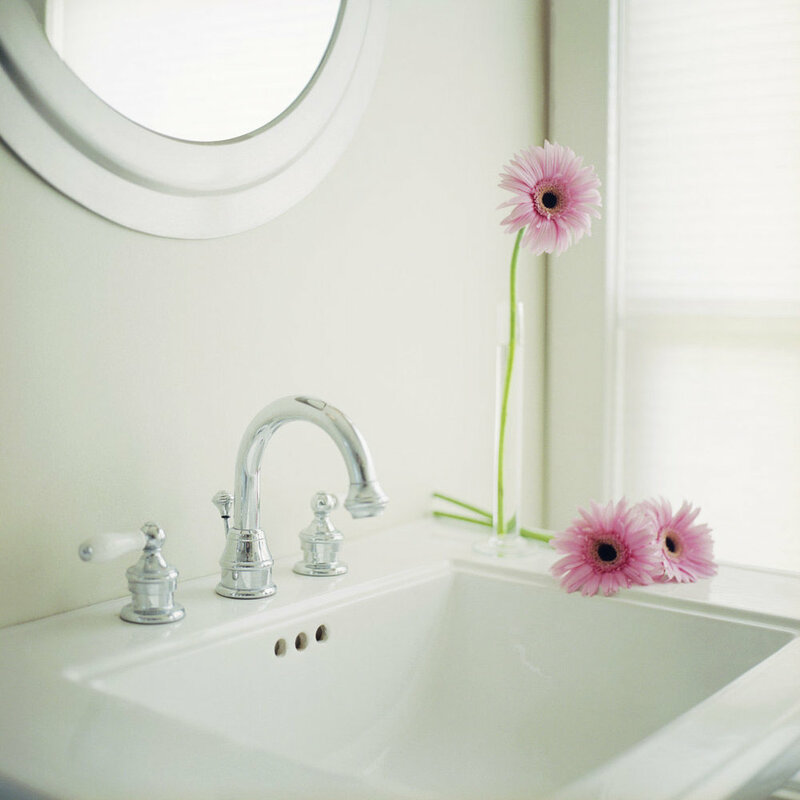 Sinks, floors, showers, cabinets, faucets – everything adds up. Choosing the right elements for your needs and budget is the best way to stay on track. To put everything in perspective, we’ve created the Jostar Interiors Bathroom Renovation Quiz, which will help you figure out (about) how much the bathroom of your dreams will cost to come true. Check it out to kick off your renovation plans. Edmonton Design Week is almost here! Our upcoming installation, Design Through Time by Jostar Interiors, will debut at Enterprise Square on September 21. This is the last stop on our journey to the design world of today, and we’ve saved some of the best for last. Groovy, baby. Welcome to the 1970s. It’s time to think back to funky music, giant bell-bottom jeans, and middle-part hairstyles. This is a time where, if you walk into an office, you won’t see any laptops, and disco music isn’t accompanied by #ThrowbackThursday. As you can see, we’ve come a long way since our journey through time started in the 1860s, but we’re still a ways away from the interior design trends of 2017. Some of the biggest styles from today originated in the 70s, and we want to take a moment to pay our respects to shag carpet, among other design influences. We’re taking a look into bedroom design specifically, exploring the colours, prints, and textures that brought this decade to life. Have you ever seen a painted stripe run all the way across a room? How about a kaleidoscope statement wall? Bedrooms of the 70s were defined by the psychedelic playfulness of wall décor. Geometric and colourful shapes popped up in large proportions and were often matched to textiles and linens, creating a funky design experience that was anything but boring. On the walls, on the carpet, on the furniture! The 1970s are defined by texture experimentation, so adding shag carpet, wallpaper, and fabric to as many surfaces as possible was a must. Stripes, polka dots, and colourful patterns were everywhere and colour clashing was often employed for dramatic effect. The 70s were also a time in which a bedroom set made entirely of teak or pine was all the rage. There was so much going on all over the walls and floors that bedroom furniture often matched perfectly and looked like an identifiable set. Wicker furniture was a definable characteristic of the time, which added another layer of texture to an already textured space. Furniture layout also categorized the era, with bedroom furniture often placed along the same wall, in one big line up. As the reveal of Design Through Time approaches, we’ve been inspired by the hippie movement that defined the decade of the 70s, and the groovy-flower-power-peace signs that we still channel whenever we consider using a funky print or a faux-fur accent. Whether you’ve been following our journey through time over the past several weeks, or you’re just tuning in now, we hope you’ll join us for Edmonton Design Week on September 21! 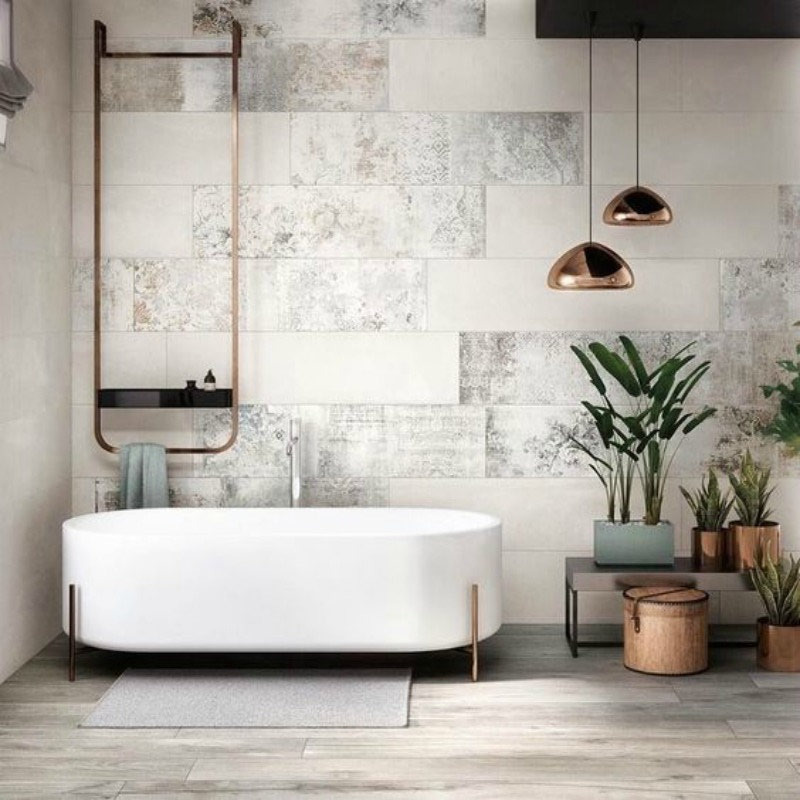 If you want some interior design inspiration right this minute, check out our Bathroom Renovation Quiz to start gathering a few ideas and channel your inspiration in the meantime. We’ve been counting down the days, and Edmonton Design Week has finally arrived! The big reveal of our installation, Design Through Time by Jostar Interiors, is tonight, and we’re so thrilled to have you join us. We’ve made it through the 1860s, the 1920s, the 1950s, and the 1970s, and have now landed at our final destination decade: the one we’re in right now. Let’s dive deeper into 2017. Today, we have access to a wealth of knowledge that influences how we share and understand interior design ideas and innovation. In the 1860s, we saw the materials used were readily available, but in 2017, it’s more about function than ease of access. We’ve taken elements of the past and trends from around the world, allowing us to develop personal taste, style, and home décor. Style in our decade is defined by elegant pieces made from refined materials, and adding personality and individual taste along the way. Natural wood is timeless and soothing. We bring it into bathroom spaces to add a natural vibe and offset shiny tile finishes and metallic fixtures. Wood can be used as an accent, but don’t be afraid to go for a full vanity or cabinet in natural wood grain to bring more earthy vibes into your home. The minimalist trend of our decade has taken the interior design world by storm, and has us all falling in love with simplicity. Introducing white walls, tile, and counters into your bathroom renovation will contribute to a spa-like feeling in your home. White looks great with any type of wood or accent colour, and is an easy way to make your bathroom feel crisp and clean. Finally, let’s talk about modern layouts. Bathrooms of today are all about making spaces that are functional and beautiful for the people who use them. One of the biggest trends we’re seeing is a move to more open spaces that let in lots of light and provide ample room to move around and relax. To start catching your bathroom up to the times, head over to Bathroom Renovation Quiz to get going on planning and getting excited about your next renovation project. In just a few weeks, during Edmonton Design Week, we will debut the Design Through Time by Jostar Interiors installation at the Enterprise Square Gallery. On September 21, join us on a trip to the past and discover the eras that shaped the interior design styles of today. In our last post, we explored kitchens of the 1920s, which leads us into the third week of our journey through time. Now, turn your attention to the 1950s! This was a time of soda pop, the rise of the suburbs, and some stellar interior design trends. We’ve settled that life was very different in the 1950s, so let’s take a look at some of the biggest living room design trends that may not make this era feel so far away after all. Ever seen a robin egg blue sink? How about pink flooring? This all-over colour trend was huge in the 50s – from bold couches to intense patterns on textiles, bright and beautiful colours were all over the living room. Pastel colours were also building popularity, way before millennial pink was in centre stage. One of the key areas in which 1950s living room design came to life is furniture. Categorized by experimentation with new shapes, clean lines, and potentially questionable fabric choices, no one can deny that furniture in the 50s had style. Vinyl covered chairs were all the rage, and living rooms began to see home bars change house parties forever. This was also a time when televisions and record players became standard in most living rooms, but beyond that, we started to see the rise of decorating as we know it today. It was no longer enough for a lamp to just light the room; the shades and shapes of the bases became stylized and eye catching. Formica tables were a must-have, and even clocks took on a quirky, playful motif. Ladies and gentlemen, welcome to the 1920s. Geometric tile is making a huge statement. From kitchen floors and backsplashes, to countertops, people are embracing easy to clean surfaces that infuse both practicality and style in the home. Under the influence of Art Deco architecture, chevrons, sunbursts, and symmetrical designs were popular in the 1920s, and they’re back in a big way today. Kitchens of the 1920s were also categorized by a streamlined aesthetic, not too different from the minimalist trends of today. Clean white lines and layouts focused on functionality defined the spaces then, and paved the way for the crisp porcelain sinks you might spot in your neighbour’s kitchen now. This is one of the first iterations of a modern storage unit. 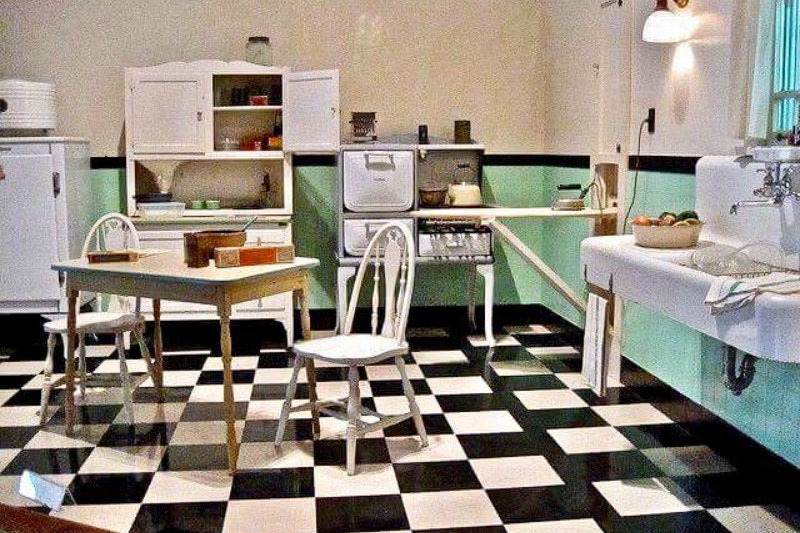 Kitchens in the 1920s were the hub of the home, and innovations of the time (such as an early waffle iron) meant that families needed more storage and organization options. The resulting Hoosier cabinets had slide out shelves, many drawers, and multi sized compartments with doors, paving the way for the cabinets and islands of present day kitchens. We’ve said it before, and we’ll say it again: storage is one of the most important parts of your bathroom design. Clutter can disrupt even the most elegant room, so be sure to think about your storage needs before starting your bathroom renovation or home decor change. Read on to learn our five favourite tips to easily increase your bathroom storage, and optimize what your space can do for you. Storage doesn’t have to be complicated. A floating shelf beside your mirror, a wall cabinet in an unused area, or even a magnet board can be great options to turn your empty walls into storage solutions. Adding sliding drawers in cabinets is a great way to create smarter storage for your bathroom items. Sliding drawers help make the most of deep cabinets, and because bathroom items are usually small, sliding storage helps ensure nothing gets lost in the depths. From an unused alcove to an awkward corner, another great way to add storage in your bathroom is to create a customized unit. Even adding a small ledge above a mirror or an extra shelf inside a tall cabinet can be effective in creating more storage areas. In Edmonton interior design, not all storage solutions have to be conventional. There are endless interior design ideas, so get creative! Maybe it’s a step ladder that you’ll paint and convert into a free-standing shelf, or maybe you’ll create your own storage unit out of some old wooden crates – don’t be afraid to think outside the box and make your space unique. Finally, adding pegs or hooks is a simple and efficient way to boost your bathroom’s storage capabilities. Hanging your styling tools, your towels, and your toiletry bags keeps them neat, accessible, and helps keep your surfaces clear. No matter what bathroom style you have (or want to create), Jostar has ideas and solutions to make even the most cluttered space functional and smart. For more help, get in touch with one of our experts today!